Bosque County administrative offices are located at 201 South Main Street, Meridian, TX 76665; phone: 254-435-6311. 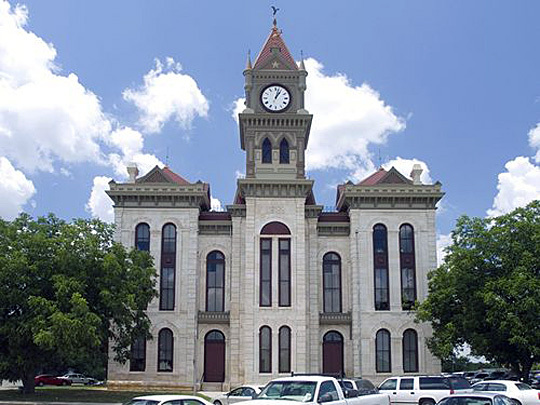 Photo: Bosque County Texas Courthouse, photographed by username:Colcholl, 2010, en.wikipedia.org, accessed June, 2011. An area known as Bosque Territory along the northwestern part of McLennan County was part of the Western frontier. Few settlers lived in this area but in the winter of 1853-1854 those that did, signed a petition asking the legislature of the State of Texas to create a new county. Members of the legislature, during the fifth session, submitted legislation to establish the county of Bosque. The legislation passed on February 4, 1854. During that same session the legislature appointed William Gary, T. E. Everett, William A. McCurry, John Locker, Lowry S. Scrutchfield and Jasaper Mabray as commissioners, to serve until the first regular elections could be held. They were given the specific duties to locate the county seat as near to the center of the county as possible and to purchase or otherwise receive land for use by the county. The commissioners met on June 27, 1854 and accepted the offer of Dr. Josepheus M. Steiner of 100 acres and of J. P. Eubanks of 25 acres. The land was surveyed by George B. Erath and the county seat with the name Meridian was created. Meridian Economic Development Corporation, Community Profile, City of Meridian, Texas, 2011, www.meridiantxedc.org, accessed June, 2011.